Behind a sparkling 30-save shutout by Jake Oettinger and Drew Melanson’s game-winning third-period goal, #18 BU blanked #9 Providence, 2-0, to claim its ninth Hockey East Championship and punch its ticket to the NCAA tournament. The Terriers will learn Sunday at Noon (ESPNU) where they’ll play in the Regionals. This year’s sites are Worcester, Bridgeport, Allentown, Pa., and Sioux Falls, S.D. 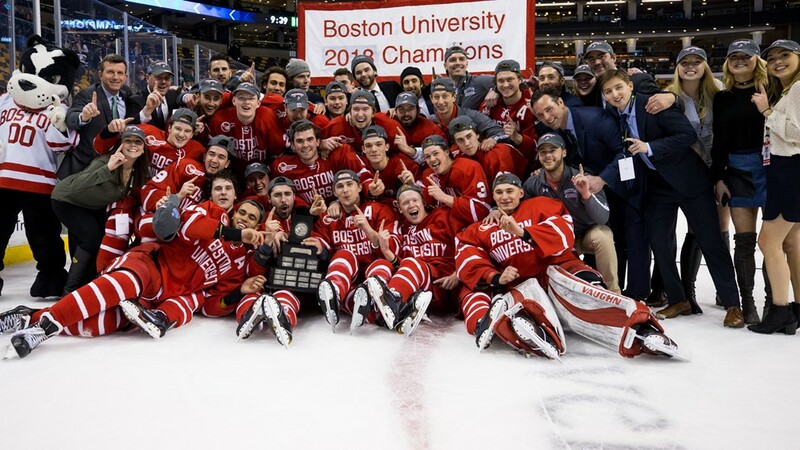 For Coach David Quinn, who had earned his 100th win behind the BU bench last month, it was the second Hockey East title since he succeeded Jack Parker in 2013. The Terriers had an 8-10-1 record at the end of first semester, before going on a 13-3-3 run with six wins and a tie in the last seven contests. Oettinger, who stopped 18 Providence shots in the first period to keep BU even at 0-0, was named tournament MVP. He had a .945 save percentage in four playoff games and was joined on the Steve Nazro All-Tournament Team by Jordan Greenway and Chad Krys. After its shaky opening period, the Terriers got their feet moving and dominated the final two frames, outshooting the Friars 20 to 12, including five grade A chances, but couldn’t put one past Hayden Hawkey. With the game scoreless after two periods, BU went to a hard cycle deep in the Friars’ zone as the final period began. 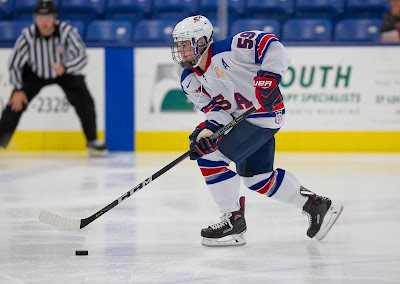 Brady Tkachuk kept the puck alive along the end boards, leaving it for Greenway who teed up Melanson at the left faceoff dot for a one-timer that went over Hawkey’s glove at 0:56. Minutes later, BU nearly added a second on a power play that produced several scoring chances. BU aggressively protected the lead throughout the third period and at 18:38, with the Friars’ cage vacant, Bobo Carpenter fired an empty-netter to close out the scoring. ►BU has won nine of its 12 championship game appearances and has an overall record in Hockey East tournament games of 74-39-1. ►Graduate Transfer Melanson’s goal was his third in four playoff games. He’s had seven points in the past eight games. NCAA Tournament bracket predictions from College Hockey News and USCHO both have the Terriers facing Ohio State in the Northeast Regional in Worcester, Massachusetts. 2019 recruit Trevor Zegras’ second-period goal brought the NTDP U17s into a 4-4 tie with Waterloo, but the Blackhawks went on to a 6-4 win. Zegras now has 15 goals and 29 assists in 40 games. 2020 recruit Dylan Peterson assisted on three goals in CIHA Bantam White’s 5-3 playoff win against OHA U17. Clayton Keller scored his 20th goal on a breakaway in the Coyotes’ 3-1 loss to Minnesota. Charlie Coyle had an assist for the Wild. In his return from the injured list, Jack Eichel had an assist, his 32nd, in Buffalo’s 5-2 win against the Blackhawks. Danny O’Regan scored his 11th goal of the season in Rochester’s 5-3 loss to Providence.